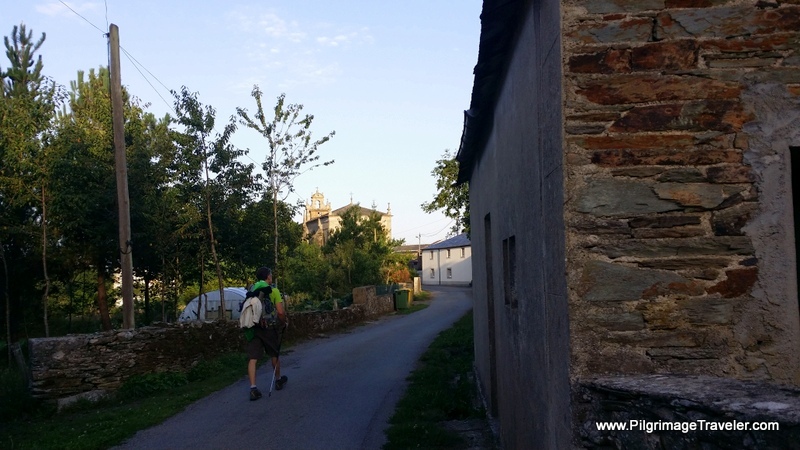 Our day nine on the Camino Primitivo was a long-anticipated walk into the historic, medieval town of Lugo, Spain. Here we were to indulge in what the city had to offer, and to take a well-deserved day off. 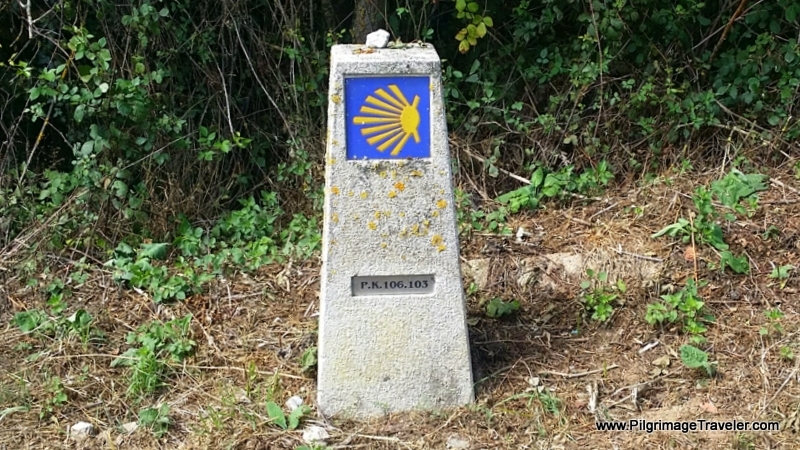 We were to also learn how the Camino de Santiago tears down borders, both in humans and the animal kingdom, and makes us closer to one world. While the walk on day nine was longer than most of the prior stages, this one didn't feel as hard. This is because the exertion level was less due to very little hill climbing required, as you can see in the elevation profile below. I did have a problem keeping hydrated, as along with the lower elevation, the heat of the day was much higher. As I listened to my voice journal from this ninth stage, I was much less negative than day eight! It was almost a totally enjoyable day! By day eight, we were beginning to be known as the "high end" pilgrims. We got this moniker because we would stay in hotels about half the time instead of albergues. We thought this was rather amusing, as we thought we were traveling on quite a budget. With two of us, the savings in an albergue was less significant, and for a few euros more I could have the comfort of a good night's sleep. This was important for me, as my coughing kept others awake, and kept me awake for fear that I would keep others awake! Despite choosing to stay in the comfortable Hotel Moneda the prior night, I did not sleep that well, due to my coughing. 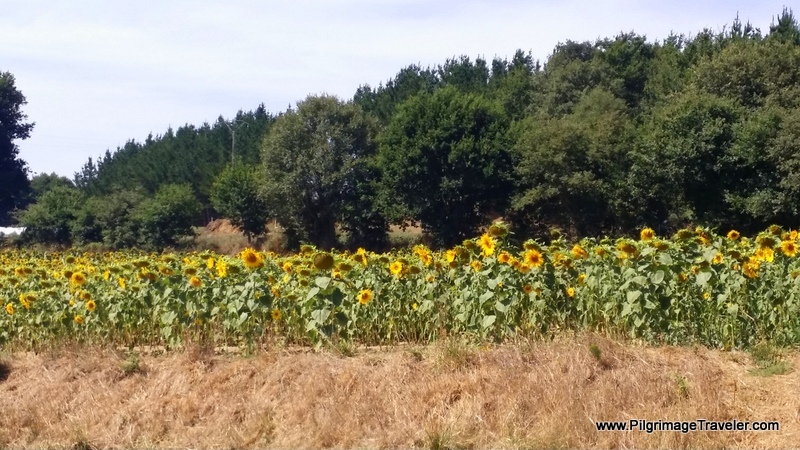 By day nine on my Camino Primitivo, I had now resigned myself to the fact that I was going to have my virus the entire time on the Camino. 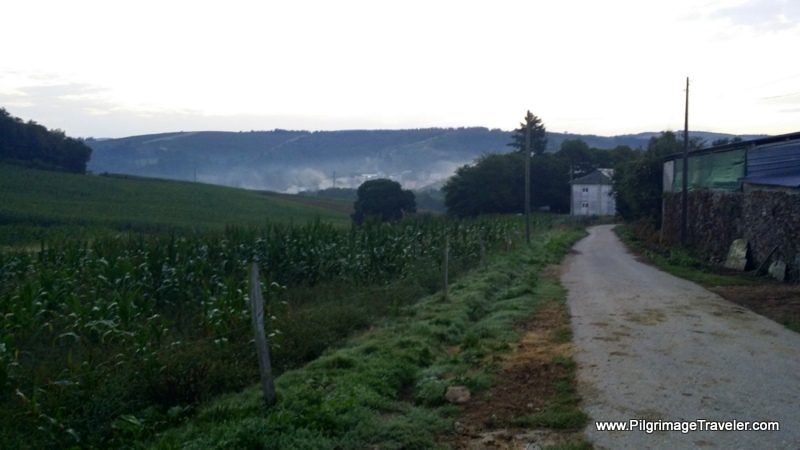 And this also I included in the Camino experience - and this was my Camino. Here is the interactive Google Map of our day, with all the available services. 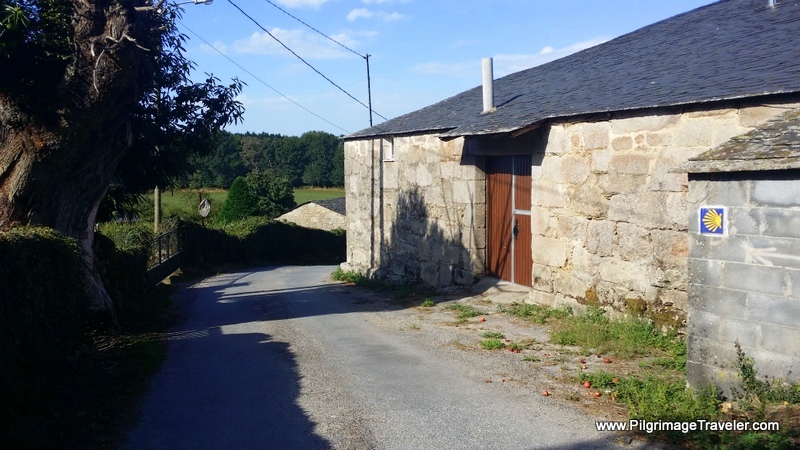 However, I did not include all the accommodations in Lugo on the map, nor all the restaurants as there are so very many! (click on the link for reservations). 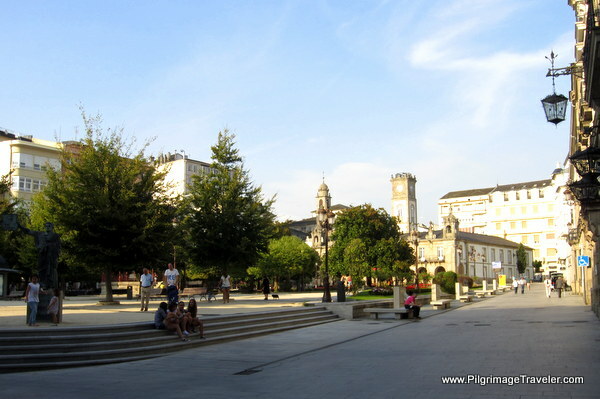 I did include the albergues in Lugo, both the municipal and the private ones. Use the map to zoom around and see what is available. As you can see from the elevation profile of our day, below, there is a climb out of O Cádavo of about 150 meters (500 feet), followed by a long downhill of 350 meters (1150 feet). This downhill is not very steep. 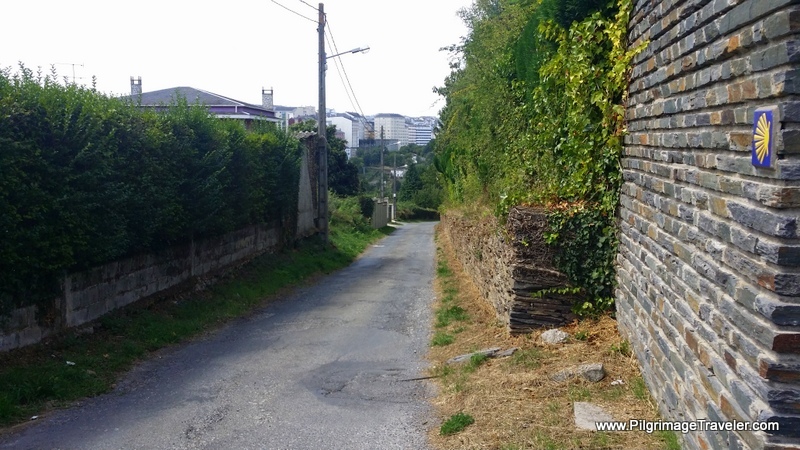 The rest of the day is gentle ups and downs, with a final short climb into Lugo itself. 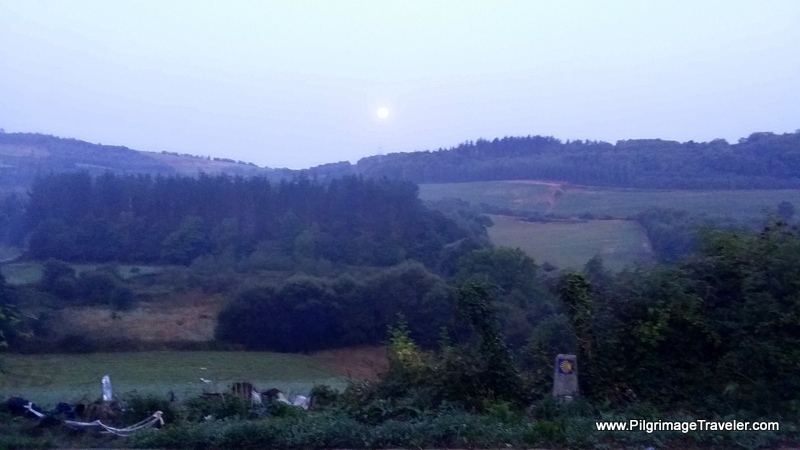 We left at 07:30, which was early compared to the other pilgrims staying in O Cádavo that night. It was another misty morning, and all was extremely quiet when we left our hotel. The café bar at the Hotel Moneda was open at 07:00 which was wonderful, to start off with the usual cafe con leche and tostada. We pulled out some of the cold cuts that we had bought the night before, to add a bit of protein and sustenance to our breakfast. 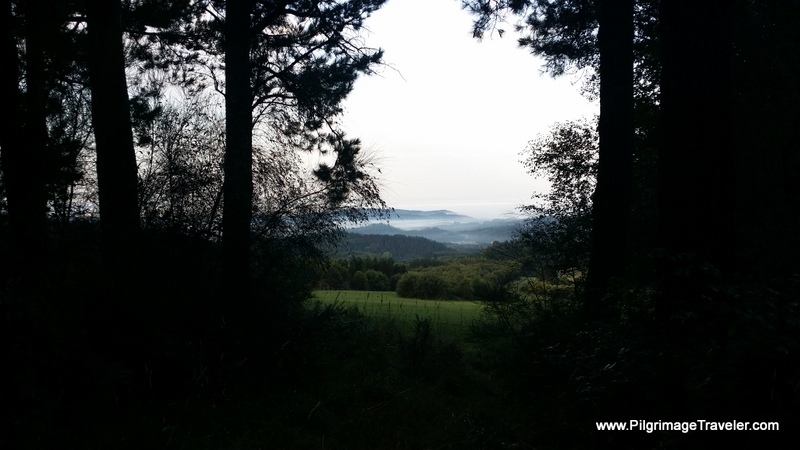 The first few kilometers gently climbed after town, and afforded nice early morning views of the surrounding countryside. 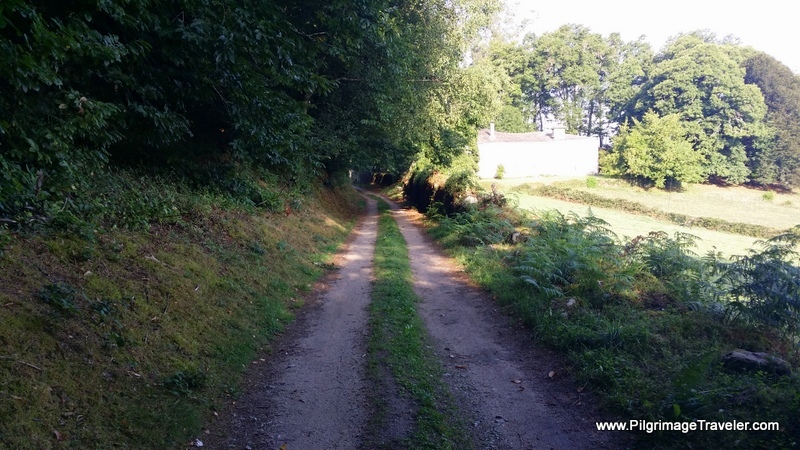 The initial part of day nine on the Camino Primitivo is on nice country lanes, a topographic feature that was always welcomed! The lanes lead into and out of the woods. In not quite 4.0 kilometers into day nine, the climbing tops out and starts its descent toward the next town of Vilabade. The forest lane eventually leads into this gravel road, just before Vilabade, towards the Ermita de la Virgen del Carmen. The Ermita, below left, was a hospital for pilgrims, built in the 17th century under the dedication of San Gabriel by local families. While we were not able to see inside, in front of the church is a nice picnic area, if you need a break when you go by. In front of the church is a nice picnic area, if you need a break when you go by. 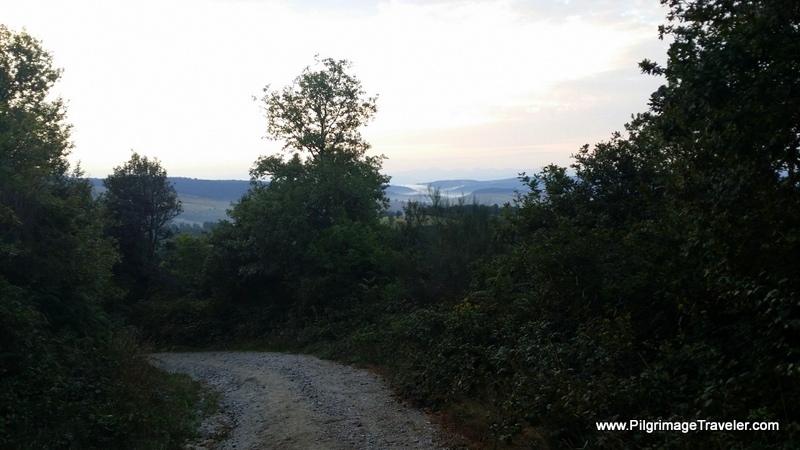 The gravel road soon lends to pavement and walks the pilgrimage traveler towards Vilabade. The parish church in the center of town is sizable for such a small town. It was a nice stop for pilgrims, with tables of information, and a very friendly hostess to help out if needed. We arrived here at 09:00 and were pleasantly surprised to find it open! You can also get a sello (stamp) here for your pilgrim's passport. 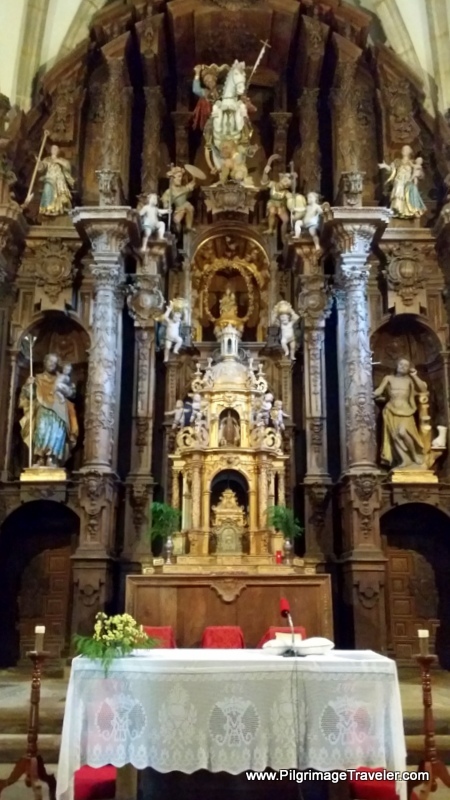 The altar is quite nice, in the Gothic style of the 15th century, with the "Matamoros" or St. James depicted as the Moorslayer, always on horseback, crowning the altar. After spending some minutes here, sitting, meditating and sending prayers of gratitude for my journey and my experiences thus far, we continued on through town. The road becomes the LU-P-1206 towards the next town of Castroverde. 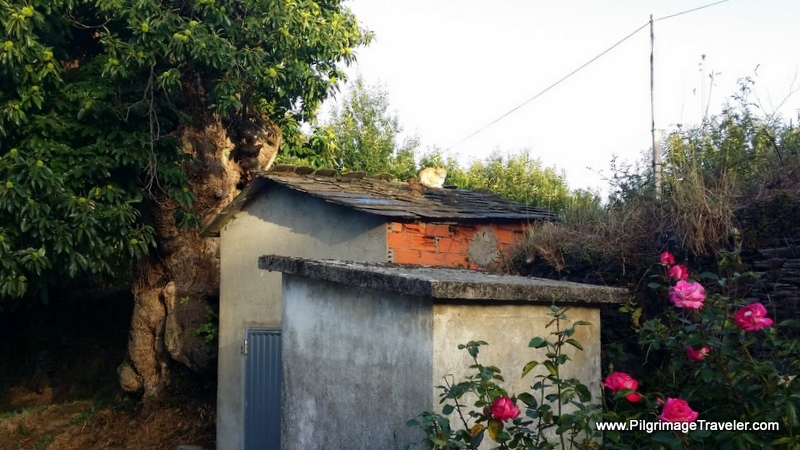 A Camino kitty drew my attention to her, in the photo below, as she warmed in the sunshine of the day, sitting atop this little structure framed by flowers. I "noticed" the kitty, or did she draw my attention to her? Interesting change in frame of reference, isn't it, if you think about it! According to Priscilla Stuckey, contemplative author of Kissed by a Fox, animals send intentions to we humans to draw our attention to them! Indeed, we both love to bask in the sun! After leaving Vilabade, the LU-P-1206 eventually joins the LU-530 in Castroverde. 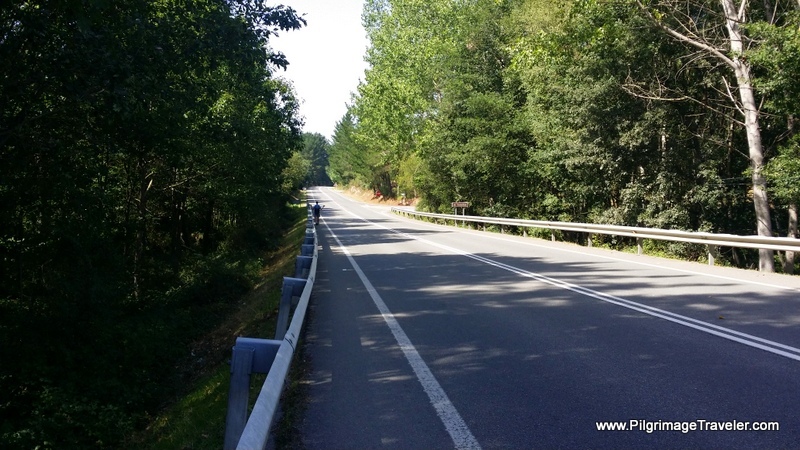 As you intersect with the main road, a sign toward the municipal Albergue de Peregrinos de Castroverde greets you. You can spot the albergue a small distance to the north. 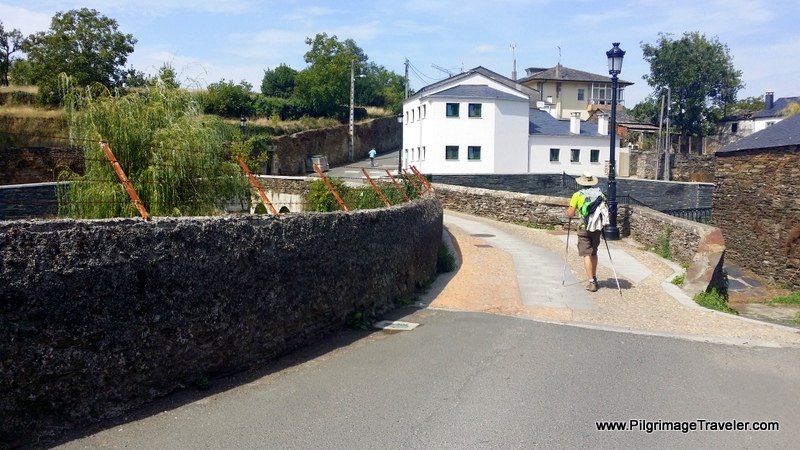 The Camino walks a very short way along the LU-530 before turning left on this shortcut, to skirt the town to the south. Castroverde is truly the last chance for obtaining food prior to Lugo, so check your supplies to ensure you have sufficient. There are three grocery stores in town, so if you need food, don't take the southern shortcut, but stay on the main road to pass them. There are also several café bars along the LU-530 in town, if you prefer this to the grocery store. 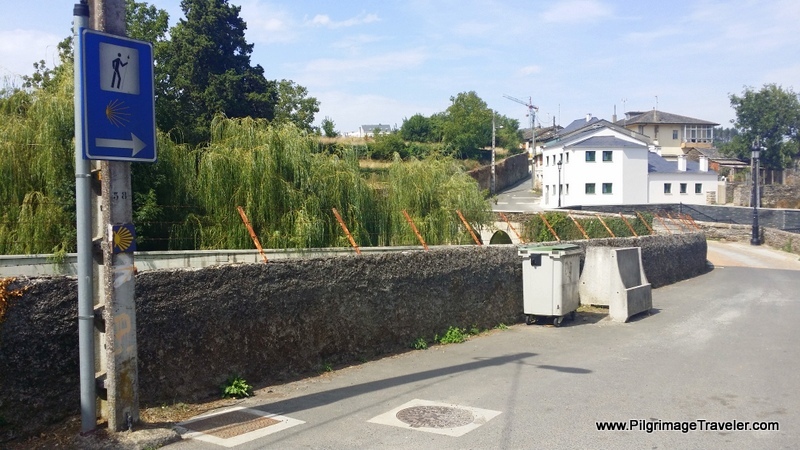 You can easily re-join the Camino at the western end of town where the LU-530 meets the Camino, from the shortcut lane at a large intersection with an overpass. Just follow the waymarks. You can also check the Google map above to see the way. There are also vending machines in two small towns farther along the way - keep reading so you will know where to find them. This will help you plan your day. I would have loved to have this information before I walked this day! 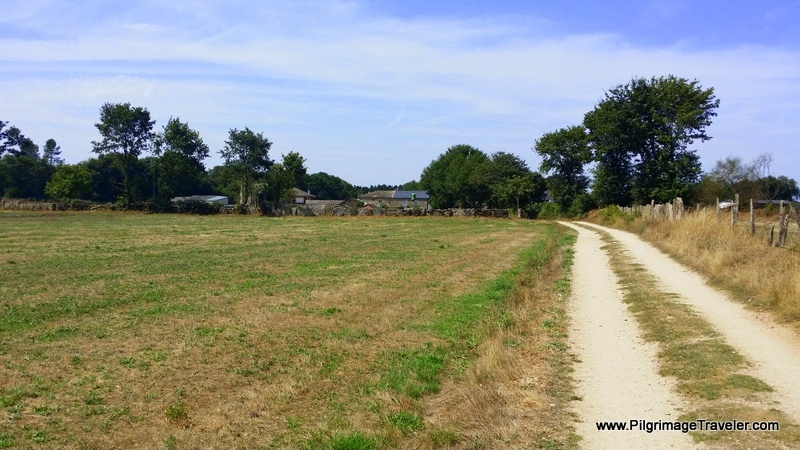 The Way is entirely rural in the next 20 kilometers with no real towns to speak of. 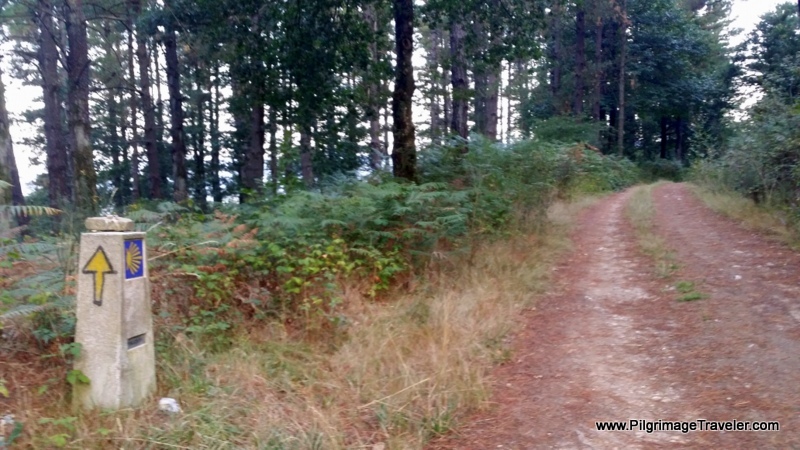 This is truly amazing when you consider that you are walking towards a major city in Galicia. 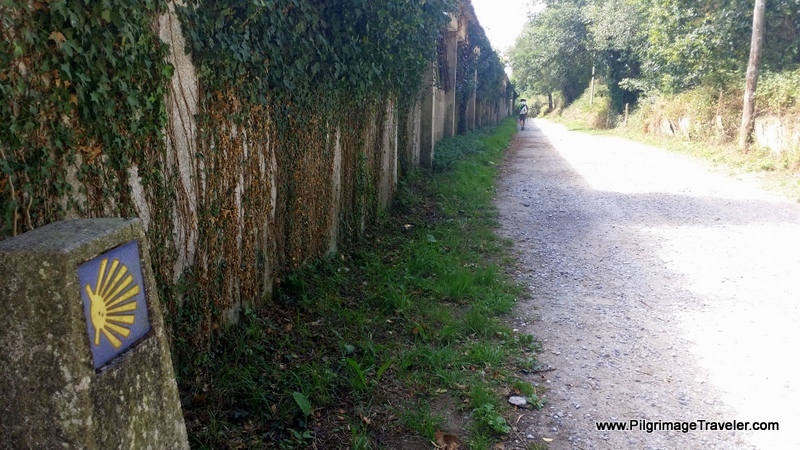 On day nine of the Camino Primitivo, it walks through alleys in Castroverde along the shortcut, and it turns here in a section that walks through town. 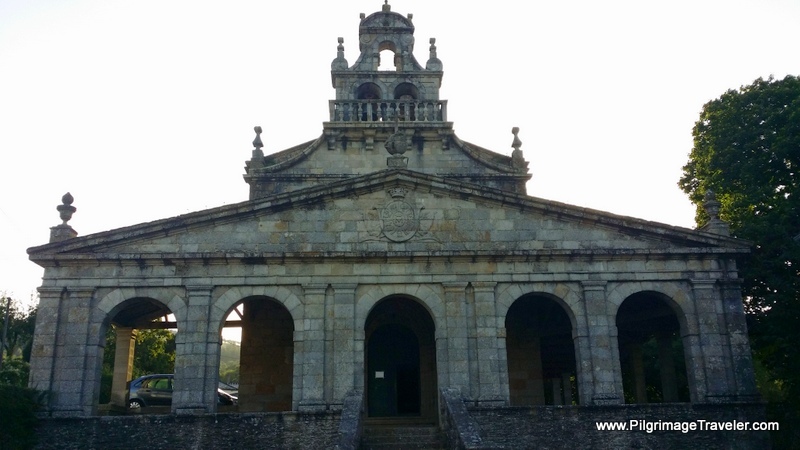 On the western end of Castroverde, is the Pensión Residencia Cortés, just south of the Camino ~ another option if you plan to stay here the night. Immediately after walking through town this picnic area and fuente appear. If the timing is right, and you brought food, this is a lovely spot to take a break. We kept going as it was only 09:30 when we passed. Past the fountain, this tractor track lane takes you on the remaining shortcut through the south side of town. 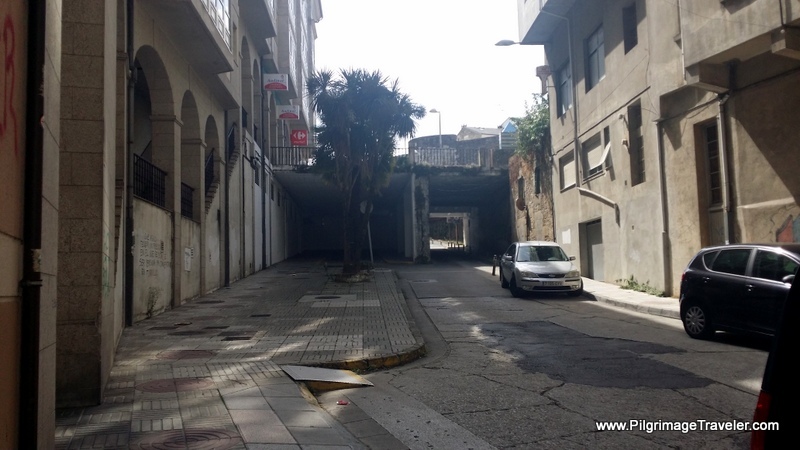 The shady diversion was a welcome relief to walking through the pavement in town. The day was already quite hot by 09:30. 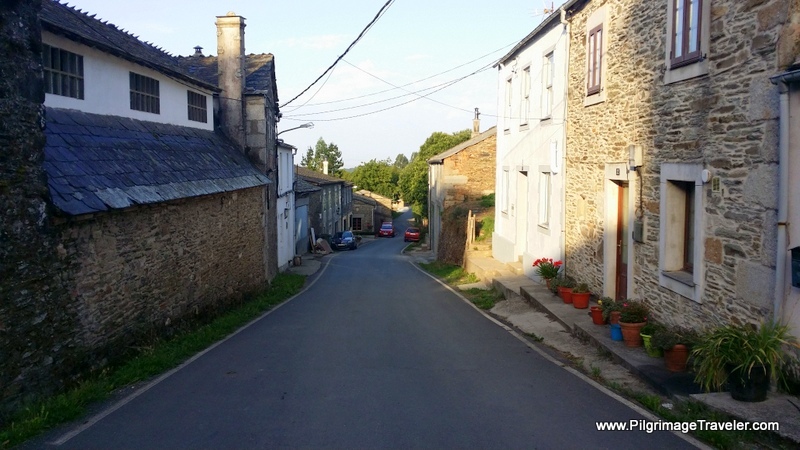 I was grateful the Camino planners did not change it as they did in Cornellana and walk us through town! When the tractor track brings you out to the LU-530, the Original Way crosses the highway and turns left on a side road on the west side of town. This is where the option of walking through town, joins the shortcut as described above. 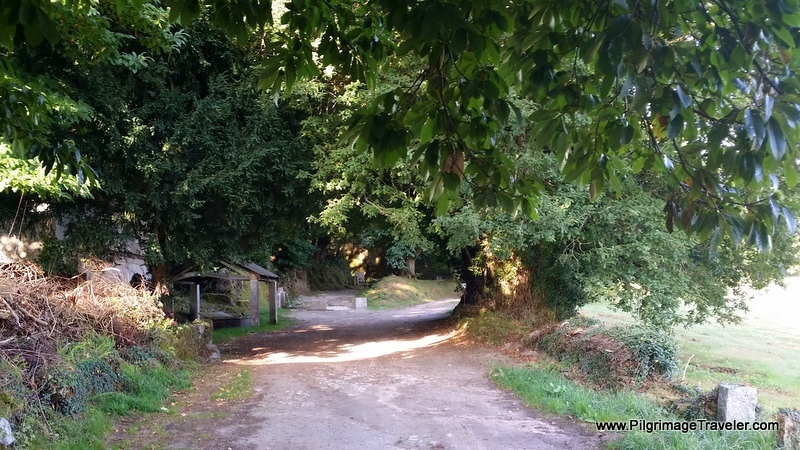 After Castroverde, once again the Camino goes back on country lanes. Countdown - 124 Kilometers to SDC - Getting Closer! 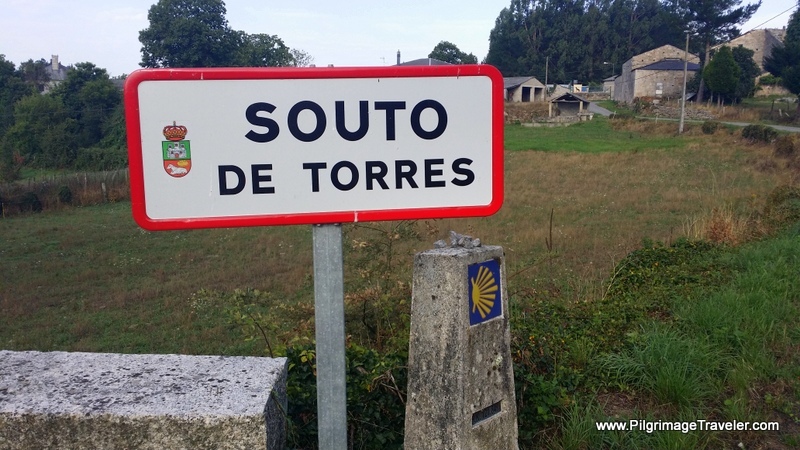 Then, nice country roads and lanes leads the pilgrim all the way to Souto de Torres, a small hamlet. You will know you are there when the lane brings you past this lovely country church. 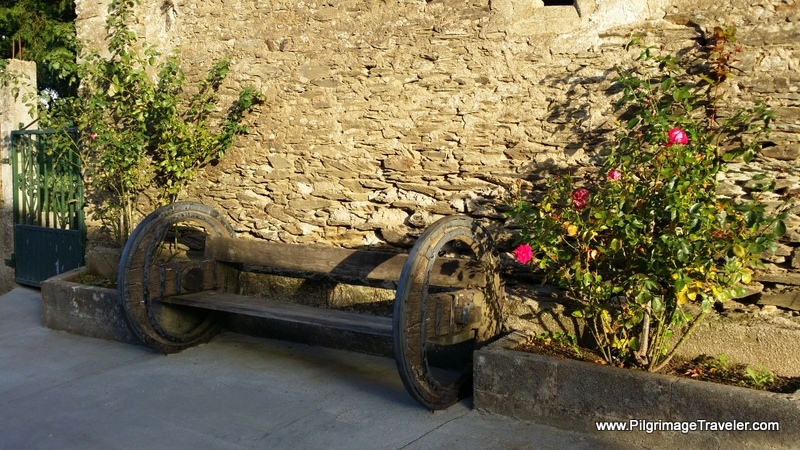 There is a nice open area at the crossroads ahead, which has an inviting bench to sit and gaze at the cruceiro and parish church for awhile. 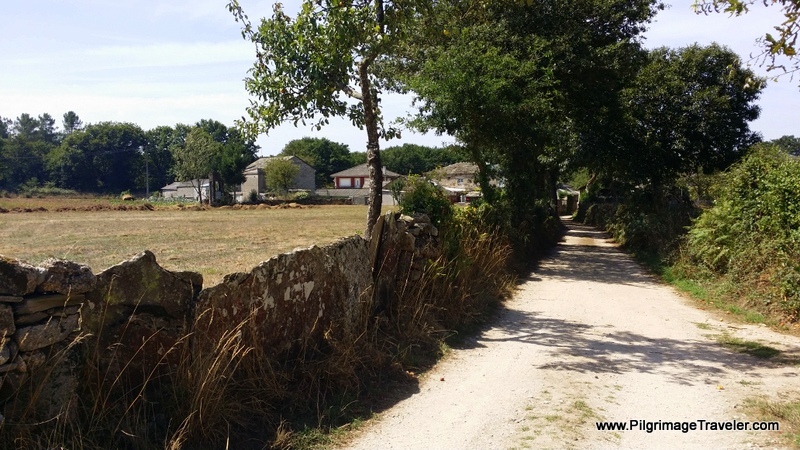 We arrived here just after 10:00 on day nine of our Camino Primitivo, so we lingered only a short while. 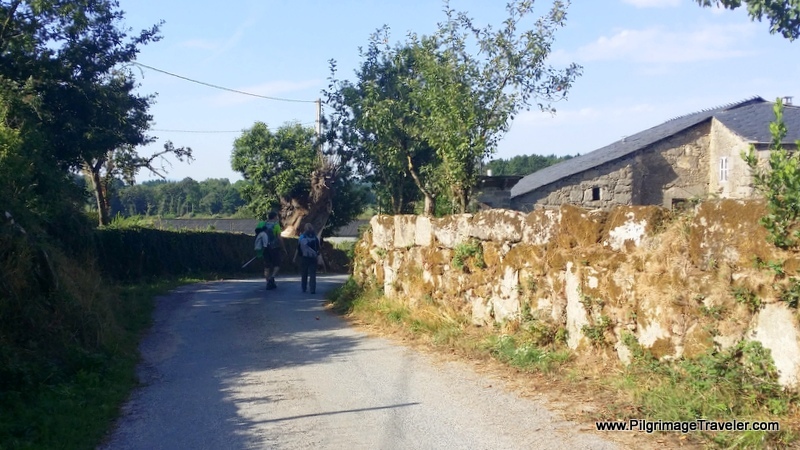 By the next hamlet of Nadela, barely seen on most maps, Magdalena, a Camino family member had caught up to us. Rich and she walked ahead, as he loved to chat whenever he could. I felt more like walking in silence, again today. My constitution, with my cold virus still didn't put me in the mood for much socializing. In Nadela, another animal drew my attention to him. This silent dog, below, that I saw watching me as I instinctively turned my head to the right after passing his house, was gazing contemplatively at me. Most likely he spent his days here watching over the pilgrims as they passed. He didn't bark or move a muscle - just gazed. I can still feel the feeling of being drawn to this creature, even as I write today! I was happy for his watchfulness, and wished I could go pet him or give him a treat! I silently thanked him instead. 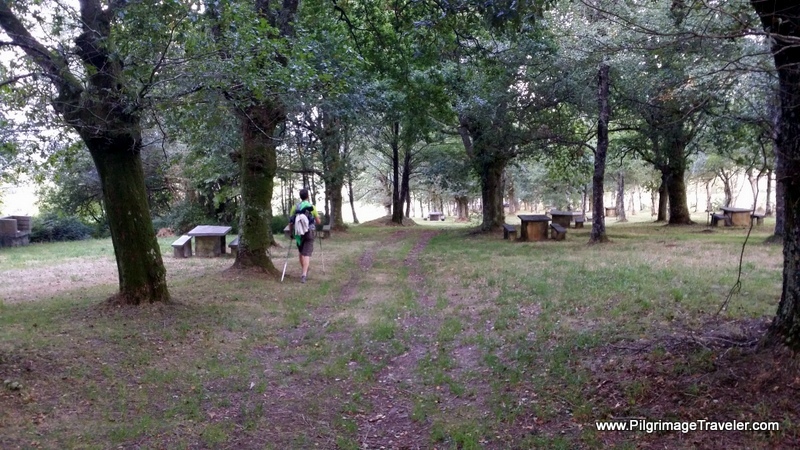 By the time we reached Vilar de Cas, at 11:00 and after 15 kilometers on the Camino, we were ready for a longer break. 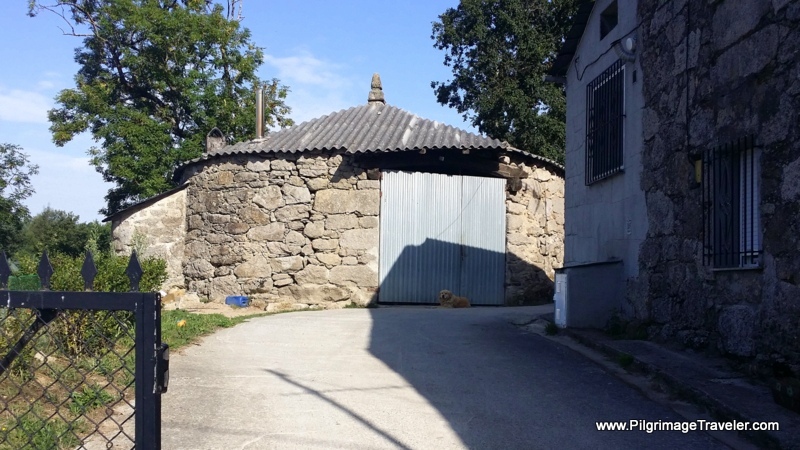 As you enter the next town of Vilar de Cas, there is a brand-new private albergue called the A Pociña de Muñiz. If you look on their facebook page, through the link, the place looks fabulous. They have private rooms in addition to a dormitory and each bunk has its own privacy curtain. There is no public café here, as far as I can tell. If you know otherwise, let us all know! However, a few meters down the road, is the first vending area. You have to look closely to find this small building housing the vending machines, shown below. There is a sign on the pole to the right of it, facing backwards in the photo below, that says "Café y bebidas frías aquí." (Coffee and cold beverages here). If you miss the sign, you may miss the vending machines. I did place its location on my Google map above, so you can see its precise location. You will be coming from the background of the photo, to the foreground, and the vending area will be on your right as you pass. You won't see the little house until you are past it and you look back. 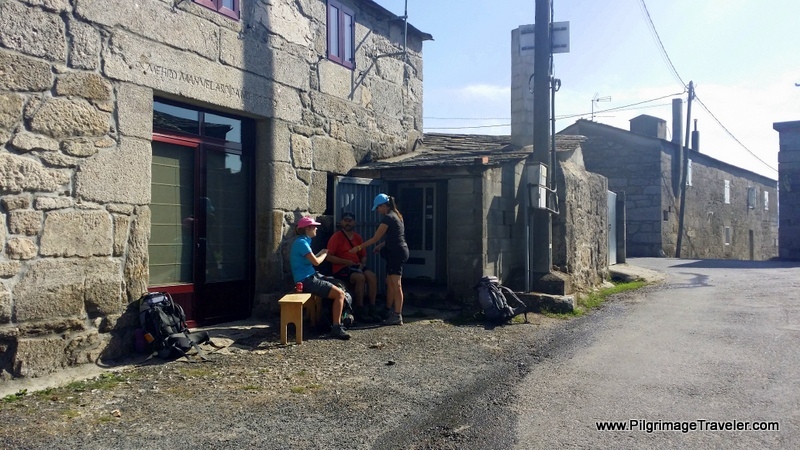 Here are our Camino family friends, enjoying the snacks by the vending machine's little house, just after we left. These vending machines were really quite fabulous. We had café con leche and cookies. The coffee really wasn't bad at all. 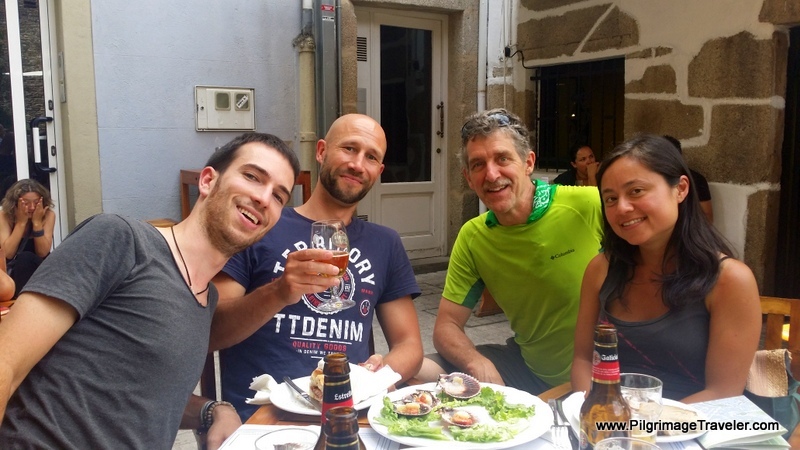 We were very grateful, indeed, for them on day nine of our Camino Primitivo. It was here that I gave a fellow pilgrim some of my Halls throat lozenges, because she thought she might have been getting a cold too. Argh! I hope I didn't give it to her! It was an extremely hot day, so maybe she only had a dry throat from dehydration. Plus she had blisters because she was forced to wear socks that hadn't dried out the night before. She had lost her second pair. Blisters and wet socks - what a horrible combination. I had one extra pair of socks, so I gave a pair to her. What goes round comes round. 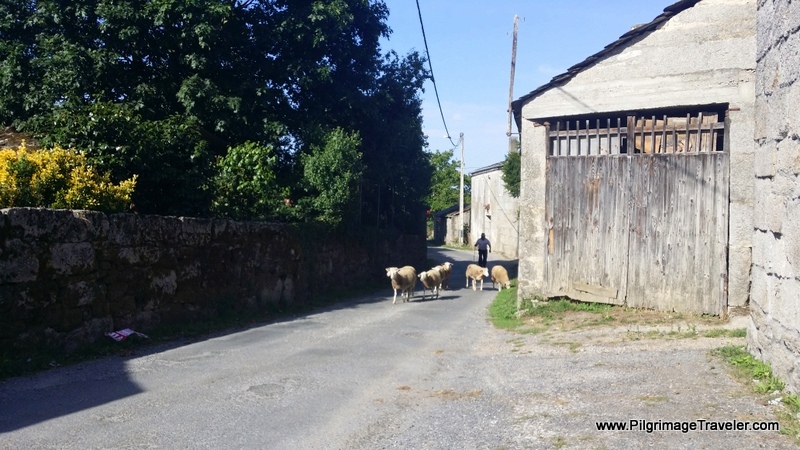 As we were sitting enjoying the rest stop, we looked up to see sheep coming toward us at the vending machine stop. I was actually sitting on the bench by the machines, when the sheep in the photo below, approached. I was so lucky to have the sheep draw my attention to them at this perfect location! Coincidence?? Was I becoming more one with the animals? I laughed when I realized the coming set-up for the photo below, well before I shot it! I was able to prepare for the photo, with plenty of time to spare. How lucky I was to be sitting at precisely the right bench to get this photo. Or was it luck? Oops! Santiago de Compostela is the Other Direction! 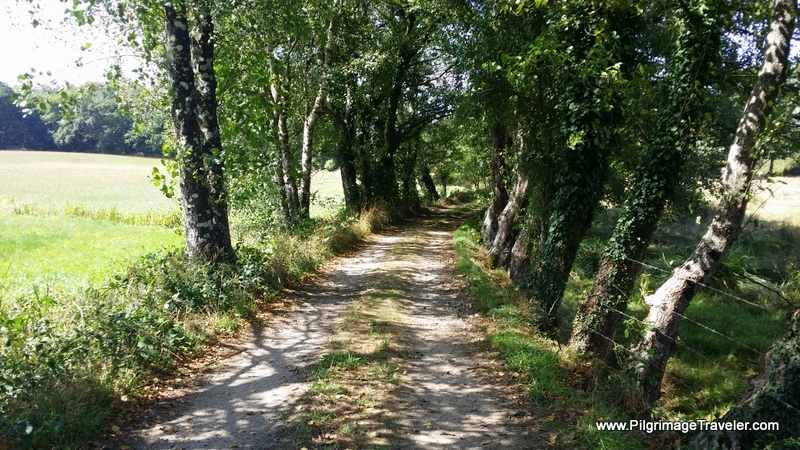 After Vilar de Cas, the Original Way joins the LU-P-2917 to walk to the next hamlet of Soutomerille. 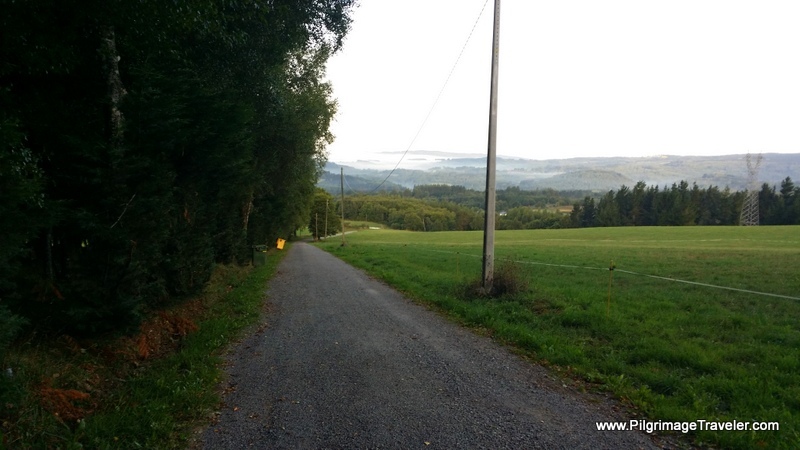 When you reach Soutomerille, you come to an intersection, after the route turns to dirt, where you have two choices. Both choices are waymarked. 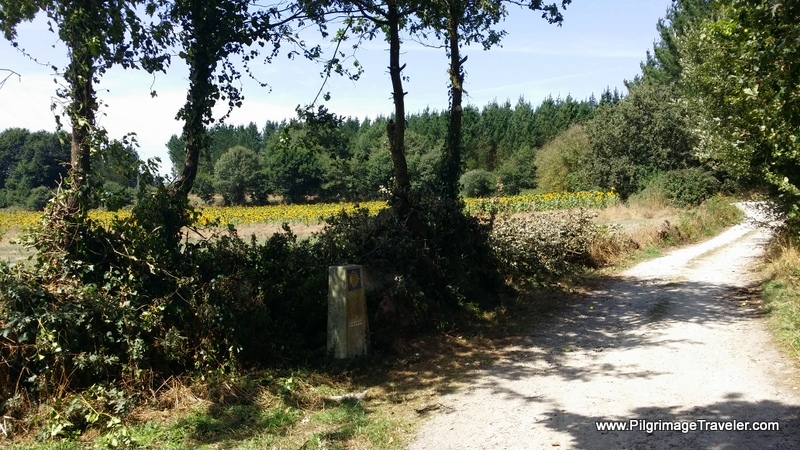 To the right, the Camino takes you through a lovely forested path to the ruined, 12th century Igrexa de San Salvador de Soutomerille, about 700 meters farther to the north. 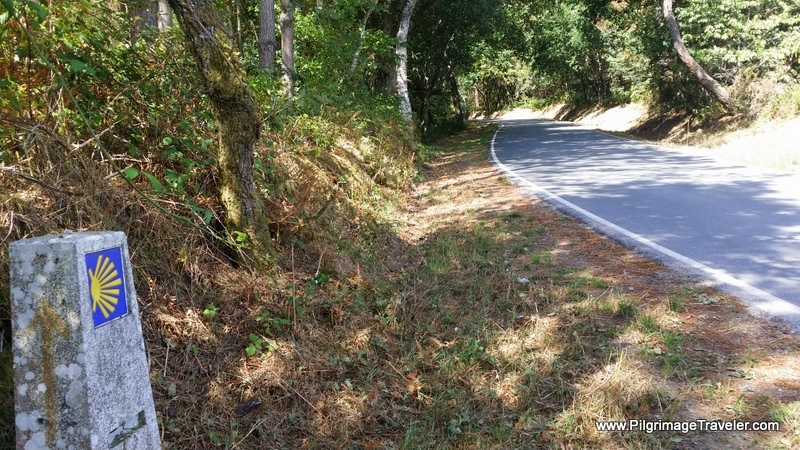 This is a recent change to the route, and we did not know of this site when we walked. If you chose to go left at this same intersection, this is is the "official" and shorter way. Click on the link above to make your own decision. I will definitely see the church, the next time I pass this way. 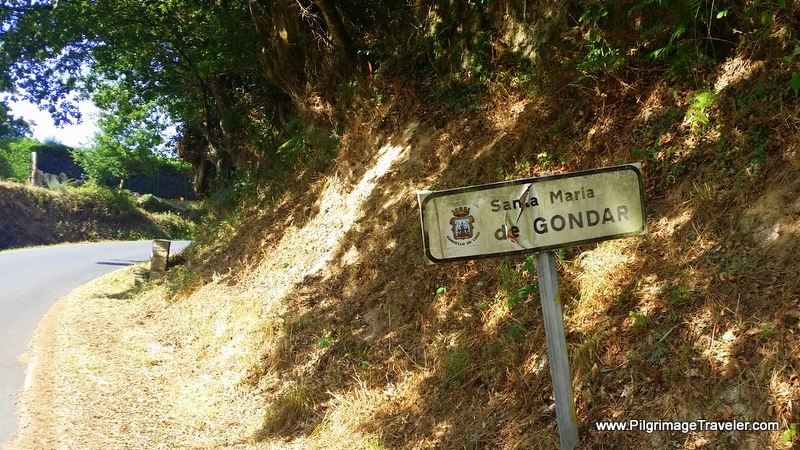 After Soutomerille, the next town we entered, was Santa María de Gondar. When walking through Santa María de Gondar, we came to the second set of vending machines. There is actually quite a nice selection of food and beverages here! I was grateful for the towns that supplied these machines and rest areas, even if they could not supply a full café bar! They probably have grown weary of rescuing hungry and thirsty pilgrims! If you notice there are microwaves to the left in the photo, and there is a sink to the left of the microwaves, (not shown), and very nice, new tables and chairs. I wish we knew this one was here, as it was much more accommodating than the one in Vilar. 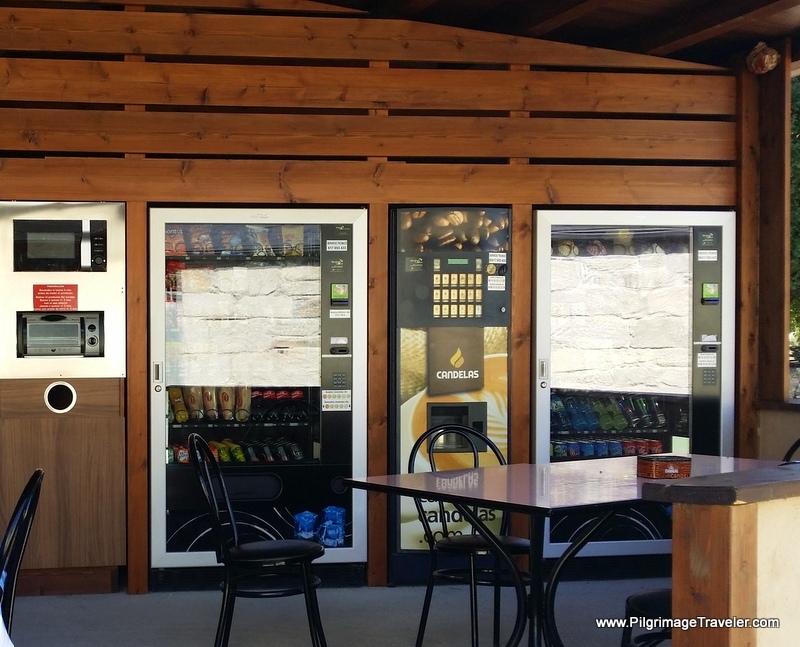 You will not miss these vending machines, as they are in an open-air shelter that is very apparent on your left as you walk by. This is the last place for refreshments before Lugo, about another 12 kilometers away! 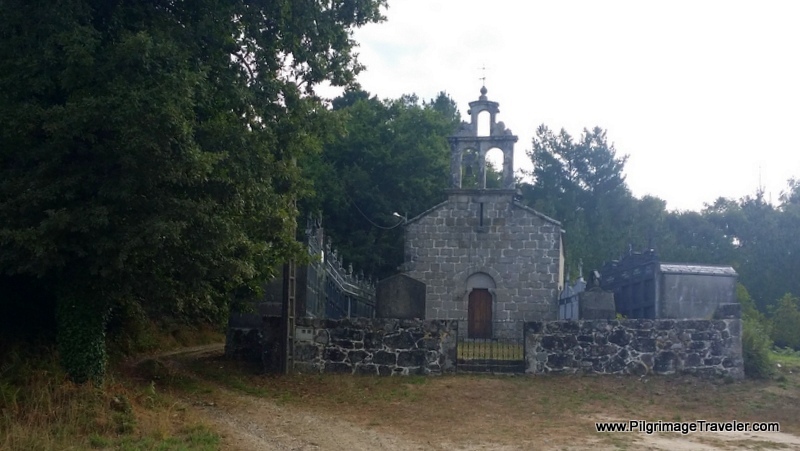 On day nine, the Camino Primitivo stays on the LU-P-2917 to walk towards Bascuas. The LU-P-2917 eventually leads once again to the familiar LU-530 near Carretera and walks towards Carbadillo for about two kilometers. Here is this stretch of road. Not great, but no hills and a bit of shade along the way. After Carbadillo, The Way turns right, into a tree-lined side road, a welcome afternoon solace from the hot sun. We decided to stop here for lunch, around 1:00 p.m. and ate from the ample supply of food we had been carrying in our packs. Whenever possible, we also took a foot break, as you can see. Airing out your feet is essential, in my opinion, to prevent the formation of blisters. Especially on this hot day nine of the Camino Primitivo! Can you see the hiking poles just beyond Rich? This is exactly where he left them as we walked on after lunch! He discovered his mistake about a half a kilometer down the road. I waited here in the shade, below, while he went back to retrieve his poles! I took the opportunity to photograph these glorious sunflowers. 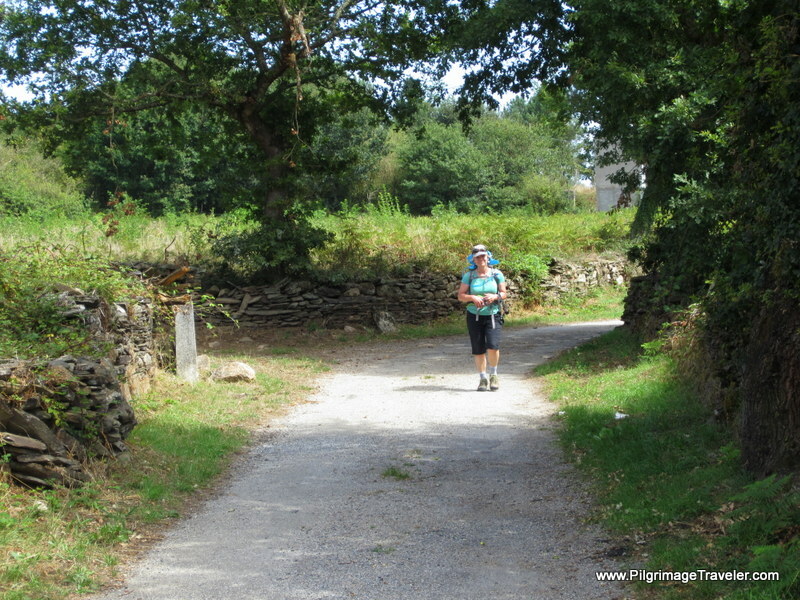 The day turned very hot and dry for the remaining 10 kilometers into Lugo. I was carrying a hydration pack and even though I was drinking as I walked, I still felt like I could not get enough. This unshaded stretch of the road seemed particularly hot and dry, despite this unusual fence that broke up the monotony. 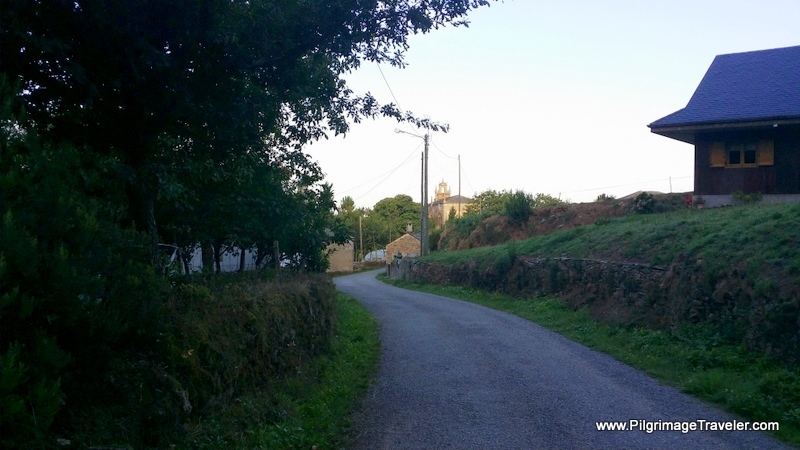 As we approached the hamlet of A Viña, we were only about 5 kilometers from Lugo. I was intrigued by the feeling of seclusion of the walls in the photos to follow. If I didn't know it, I would never have guessed that we were approaching a very large city! 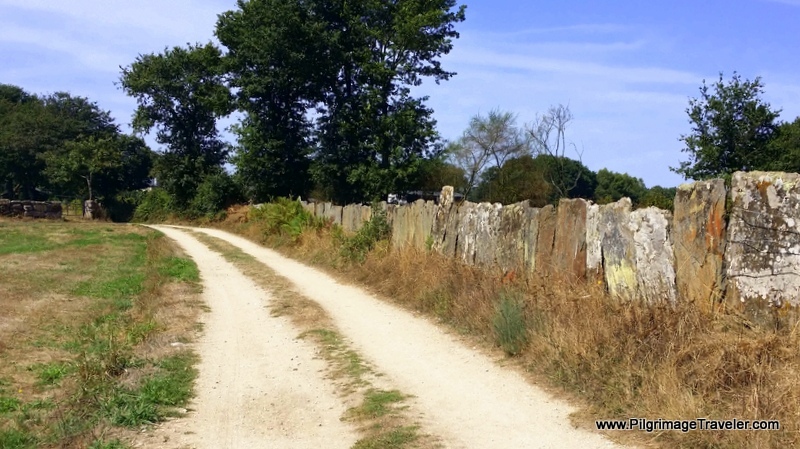 The Original Way planners did a great job for the day nine part of the Camino Primitivo! Rich Looks Back and Photographs Me! My excitement was growing at this waymark which shows 106 kilometers. 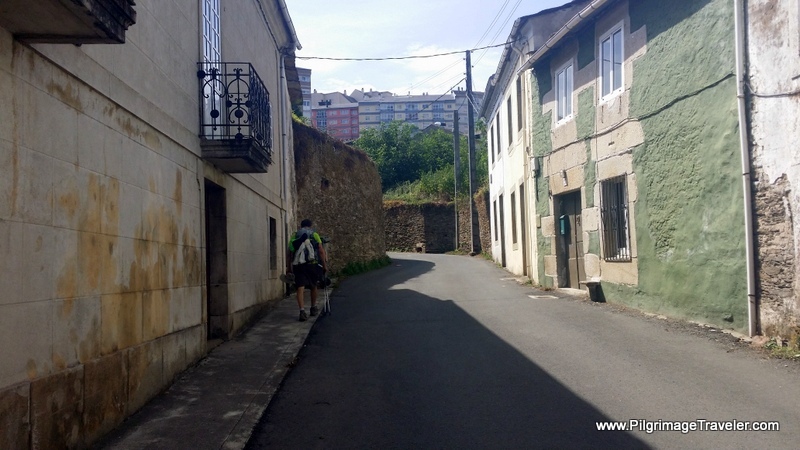 I knew that Lugo is often the starting point for those only interested in going the final 100 kilometers to Santiago de Compostela. We were not far now. It seemed truly doable from here! You can easily see why the Romans built their fortifications on this site. It is on a hill, and very defensible, with rivers and streams on its borders. 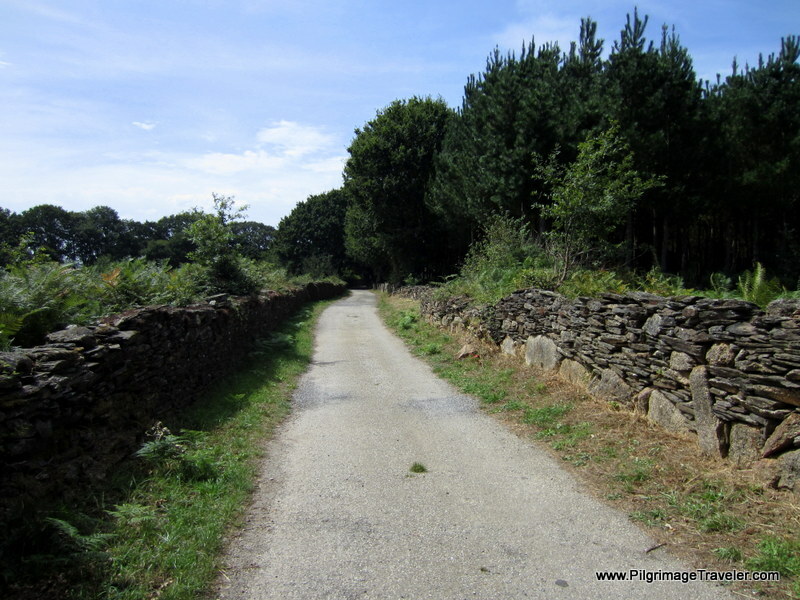 So the Way, of course, descends first before entering the old city on day nine of the Camino Primitivo. In the photo below, you can also see the aqueduct leading into town. 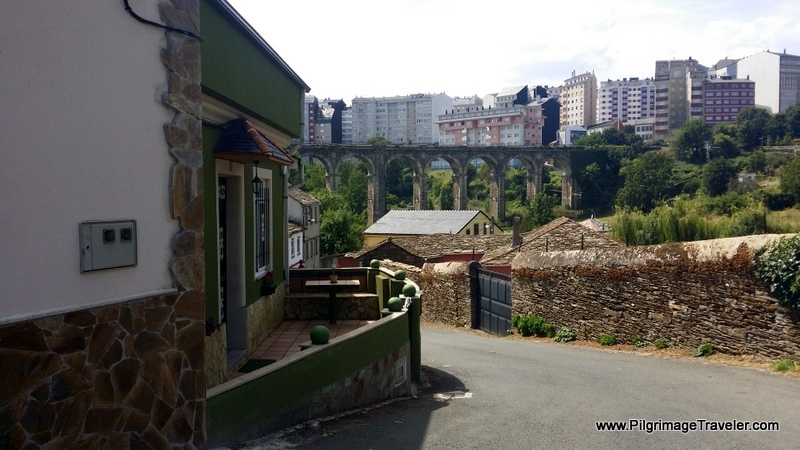 Just after crossing the bridge, the Way turns uphill for the final ascent into Lugo. 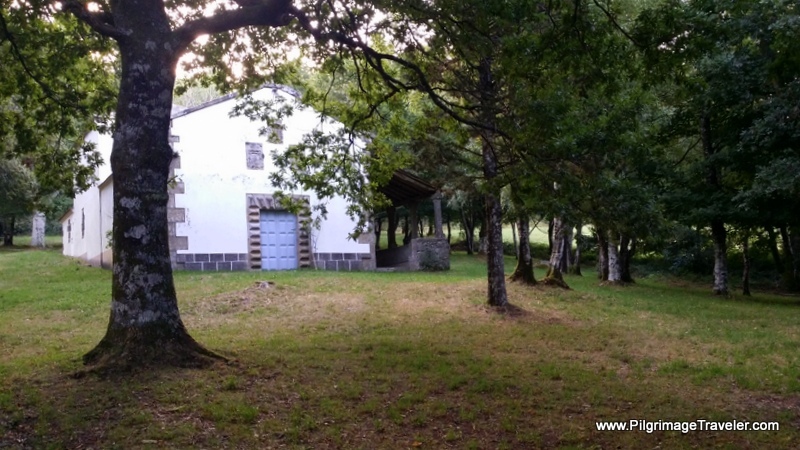 At the first turn on the way, you pass another brand-new private albergue, the Albergue Casa da Chanca. As the Way walks uphill, and up a steep set of stairs, it leads you to this tunnel. 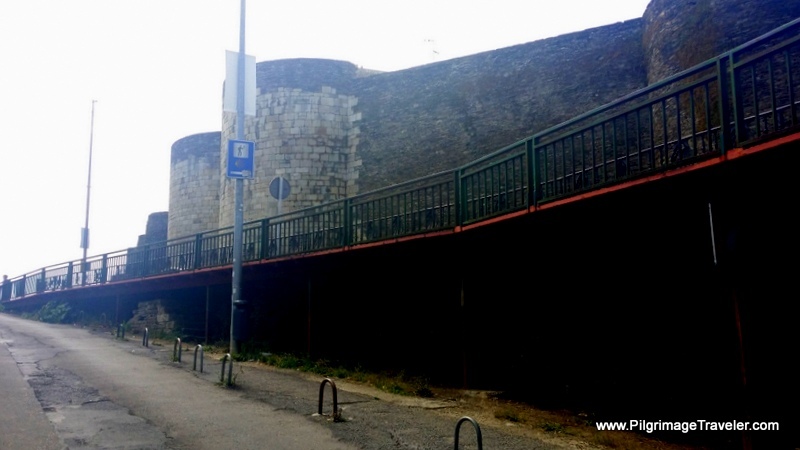 After the tunnel, as we walked up this ramp, the fortifications loomed above. (Sorry for this lousy photo - I was shooting into the sun. It is the only one I have of the first, impressive views of the wall). 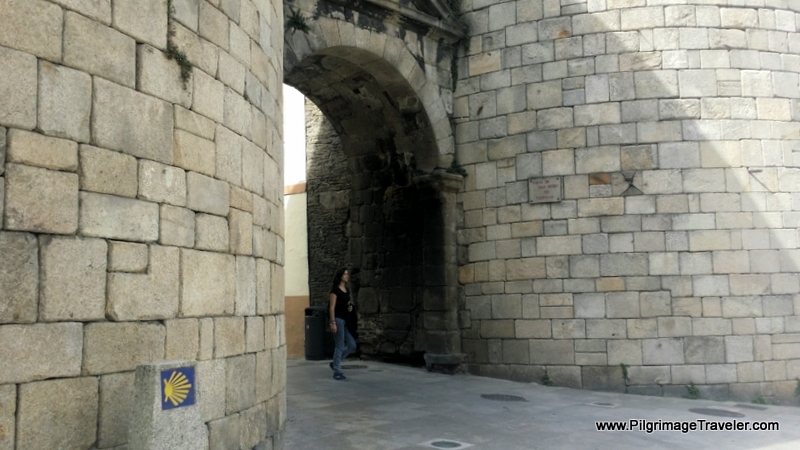 What a feeling of euphoria, to walk into the old city, through this gate, the Porta de San Pedro ou Toledana! I was hot, thirsty and sweaty, but happy to be finally here! We arrived around 3:00 p.m., a full 7.5 or so hours on the Camino. My euphoria soon vanished when loud, thumping music was soon heard inside the gate. We peeked into a side area to see a restaurant with some guy grooving to a karaoke song! It was only 3:00 p.m.! Just as we turned about face to continue walking toward our hotel, we ran into Igor and a new-found friend (to the right in the photo - sorry, I can't remember her name!). We greeted one another with joy, they grabbed us and we headed back to the same loud restaurant for tapas and beer. 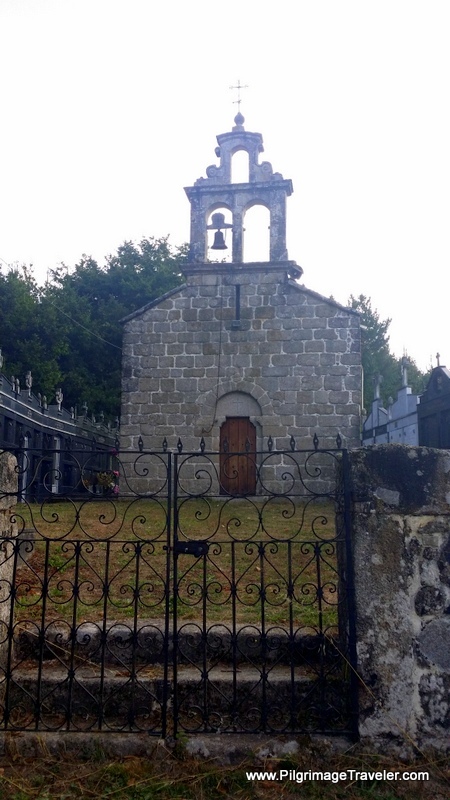 I later realized that the loud attention-grabbing music did precisely its job, attracting weary pilgrims in the afternoon of their day nine on the Camino Primitivo! Ha ha ha! I had to be careful to re-hydrate and drank two large bottles of cold water too! With my hunger and thirst quelled, I was becoming a happy pilgrimage traveler once again! Soon in walked Matias! It was a sweet celebration for the end of a very long day's walk in the heat, and the beginning of a long rest period! Salud! 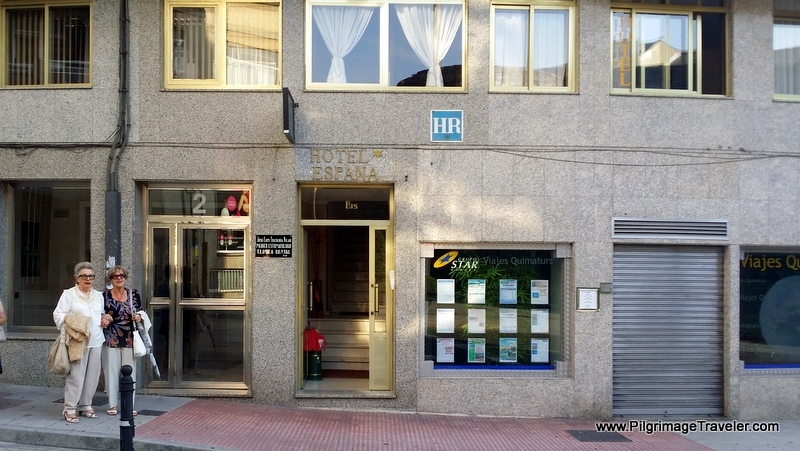 It is right after this café, the O Candil, that the municipal Albergue de Peregrinos de Lugo can be found, on the first turn to the right, on the Rúa das Noreas, several meters farther along. 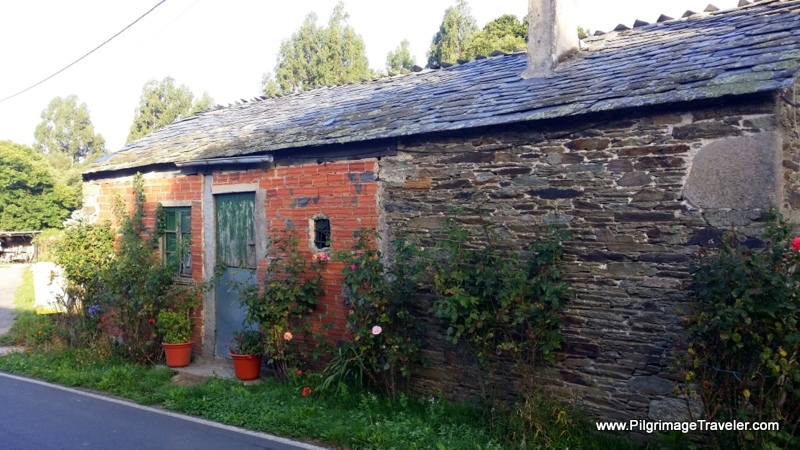 There are many more accommodations in Lugo, and three more private albergues, the Hostel Cross, just north of the cathedral, the Albergue Lug 2 and Roots and Boots on the south side of town. 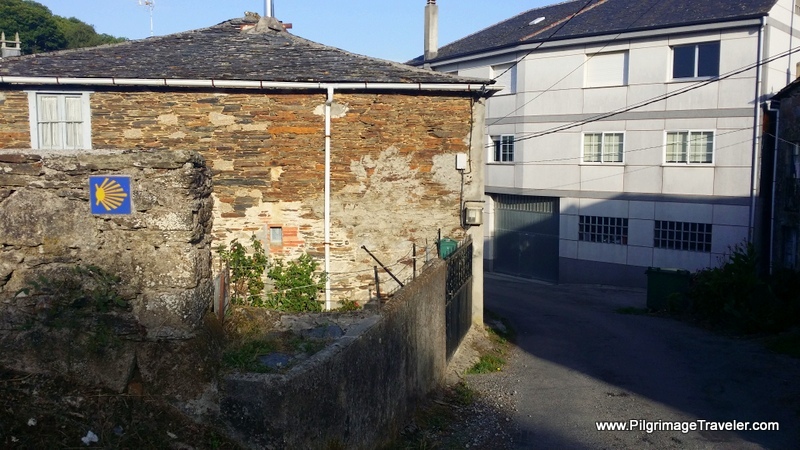 Click here to see even more choices in Lugo! 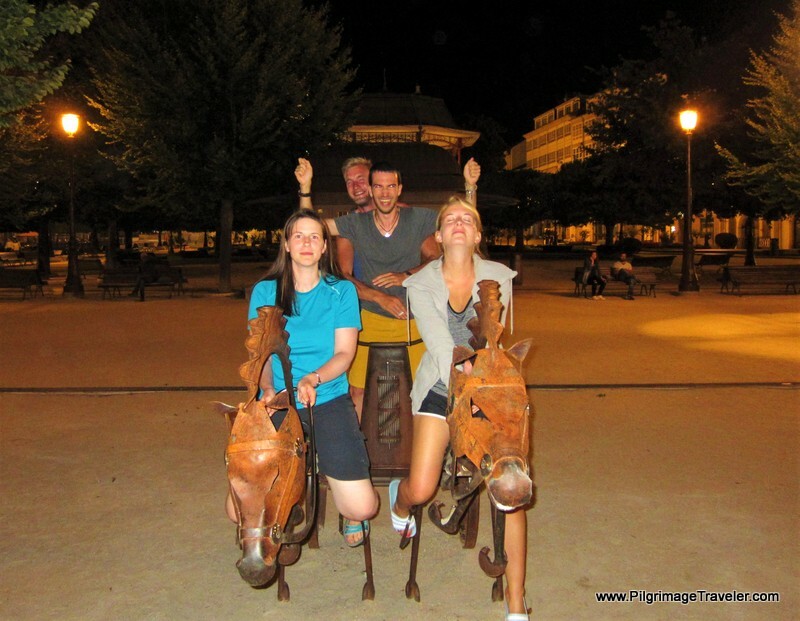 The evening of day nine on the Camino Primitivo, our Camino family all gathered in the main town square (Praza Maior) and enjoyed dinner together at one of the outdoor restaurants that have tables lining the square. Tonight was to be Igor's final night on the Camino. His personal Camino ended here as he was leaving to go back to work. He was our Spanish ambassador. It was he who would ensure that we all were cared for, that we understood and loved his country. It was us, who were receptive to his guidance, whether as a language interpreter, a food explainer, or a friendly Spaniard who was always positive, smiling and walking faster than most of us! Igor would herd us together like sheep, and tell us information about Spain and it's culture that we would have surely missed had it not been for his guidance. He was there to ensure that all of us had the information that we needed. He was a prime example of Spanish hospitality. Igor definitely assisted in the vanishing of the borders between all the countries that were represented in our Camino family. As my husband is skilled in bringing people together with his incredible social skills, so was Igor able to further this process to tear down borders, so that we were all one world - Americans, Austrians, Irish, Swiss, German and Spanish. Here is his heart-felt farewell speech at our family gathering for dinner in Lugo. It is so poignant! Thank-you Igor! 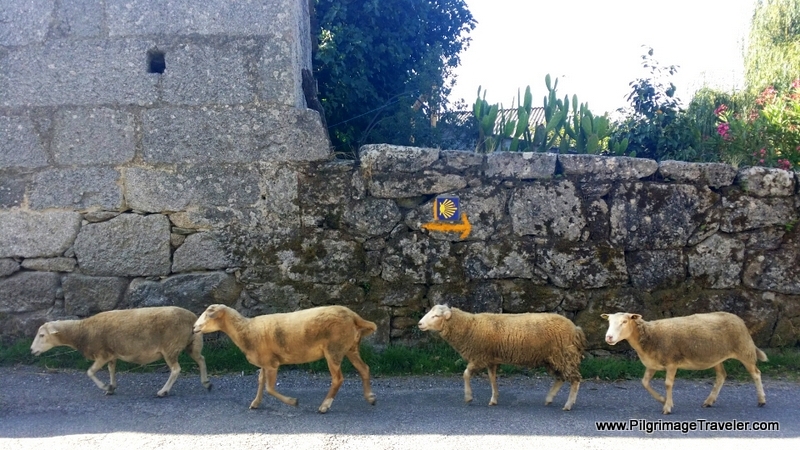 Day nine on my Camino Primitivo was certainly about uniting with all beings that I encountered. On this very special day, yes, I was able to notice a shift. I noticed and communed with the animals. As for the humans, our shared pilgrimage goal united us in nationality, yes perhaps, from similar European cultures, yet it felt not so similar many times. "My" world became "Our World" as we shared the comunitas about which Sheryl A. Kujawa-Holbrook speaks so fondly, regarding pilgrimages. I got it. We all got it that night. We were united. 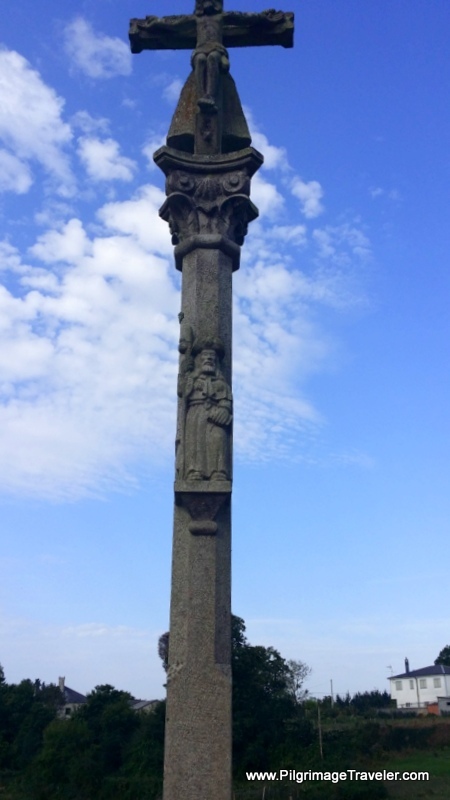 Perhaps, our family on the Original Way was, as a whole, younger and/or more physically active than other pilgrims on the other Caminos, which helped to unite us. I do not know. 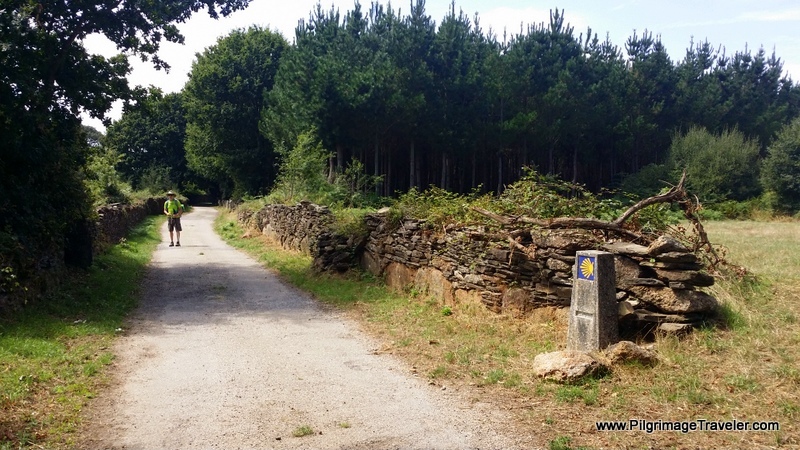 I do know that this Camino Primitivo definitely attracts athletic and/or determined people who are up for the challenge of the grueling climbs and descents of the first 200 kilometers. 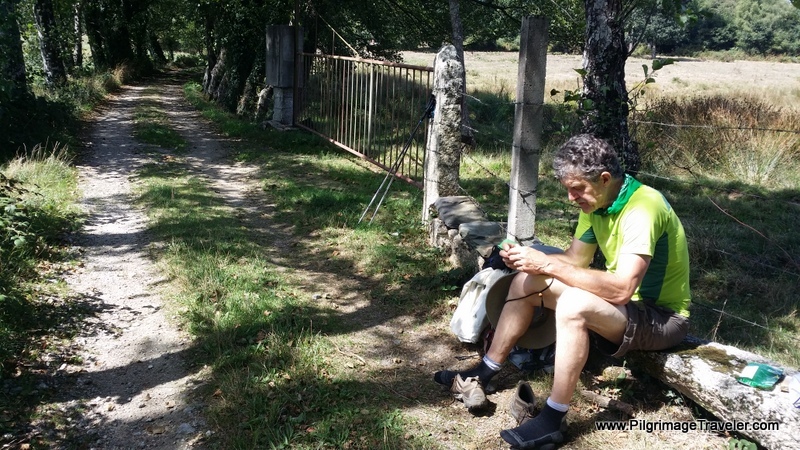 The sustained effort is the challenge for this Camino. Here, in Lugo, we were to rest tomorrow and stay another night. I deserved it and had so been looking forward to it. However, it was cloaked in sadness as well. This perhaps, was our final get-together as this particular Camino Family. 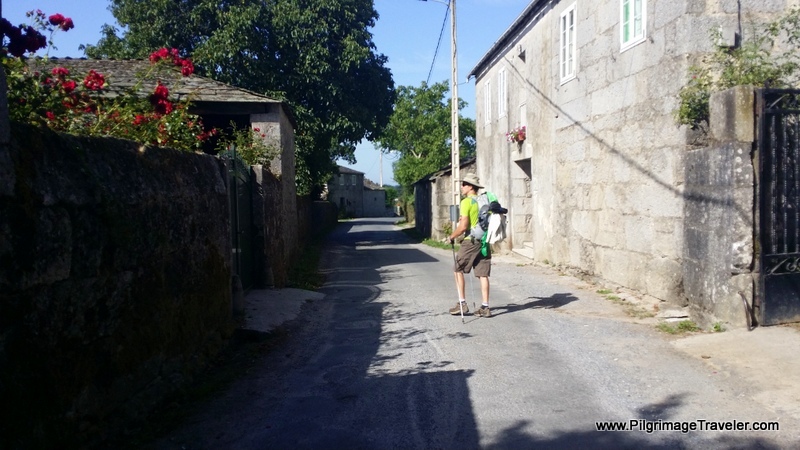 Most likely, everything was about to change in our final 100 kilometers to Santiago de Compostela. 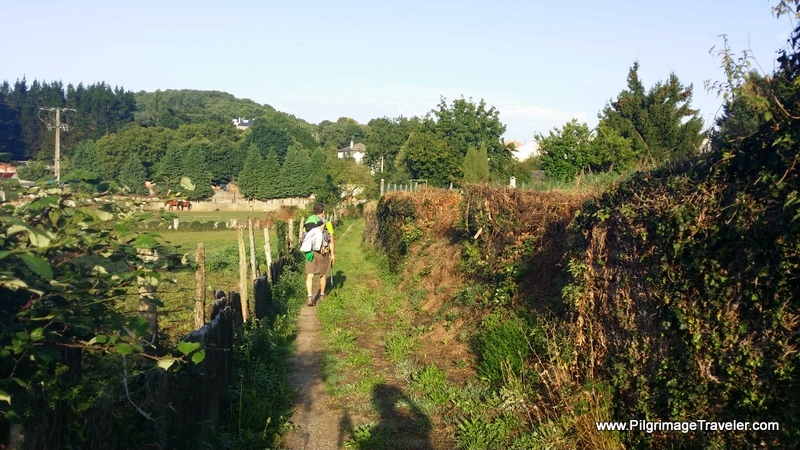 I was happy that most of the physical effort on this Camino was now behind us. Lugo is symbolic in that way. Not only do you have most of the kilometers completed, but you have most of the physical effort completed. But I was ready for what was to come. I was grateful for the comunitas I had with these people for the first 200 kilometers. I knew that we would be OK, and that more wonderful experiences lay ahead. And I did, indeed, as it turned out, make lifelong friends! 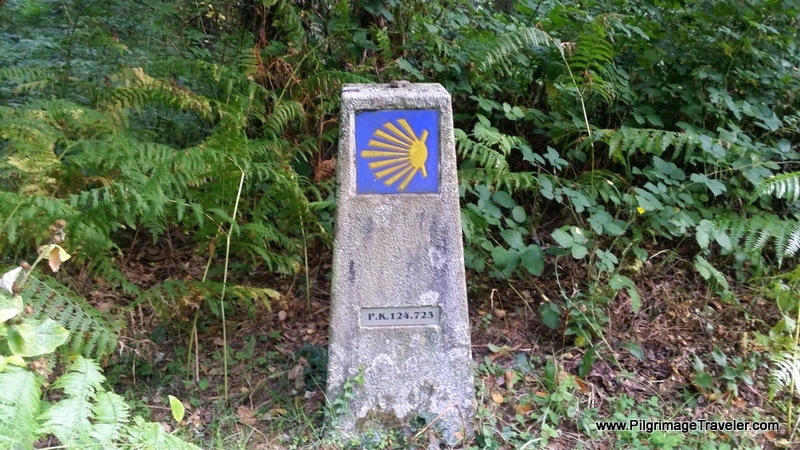 May you also find the spirit of community as you form your own Camino families on your own day nine of the Camino Primitivo! May you always know that "Nunca caminarás solo!" (You'll never walk alone!) May we all unite as one world!